A few months behind, but I am so excited to share my interpretation of my new favorite Asian noodle dish called Dan Dan noodles. 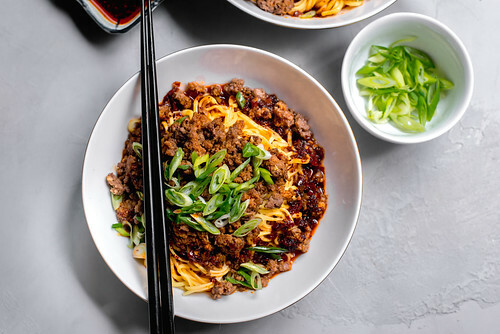 A spicy Szechuan noodle dish made with homemade chili oil (I’ll mention that a bit later) and ground meat (beef or pork). 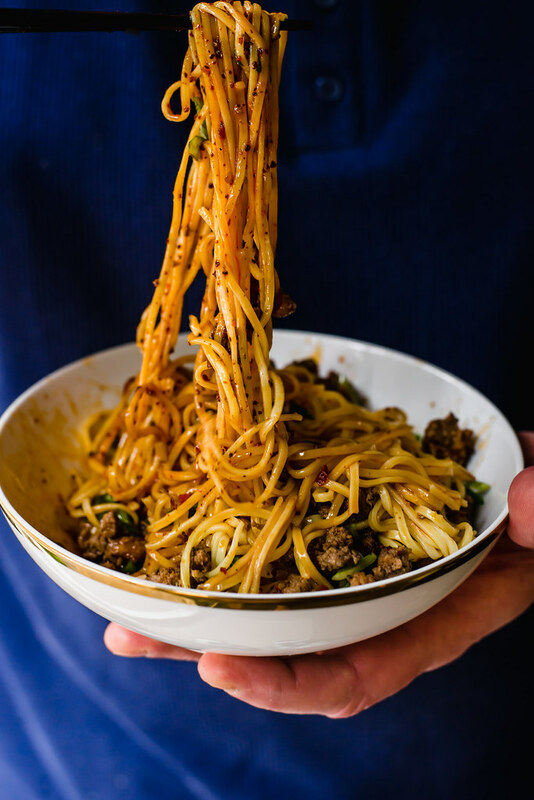 A touch of sesame oil and fresh green onions makes these noodles incredible decadent, savory and worth every single noodle slurp. Many of you know that I am always interested in learning more about Asian cuisine. It’s vast and layered and should be respected for it’s authenticity. Yet, I do like to take some of it’s famous flavors and have fun with them. After all that is how we learn about new tastes and ingredients, isn’t it? 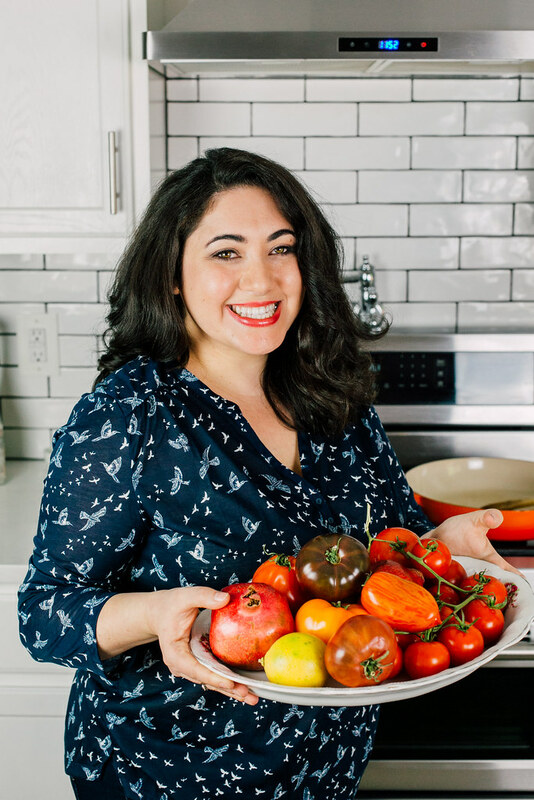 Last Hanukkah I made a play on latkes topped with kimchi and I’m still obsessing over Molly Yeh’s scallion pancake challah! Totally drool worthy and such a fun play on flavors. Well last Christmas, like most modern Jewish families do, we had Chinese food on Christmas. I made an entire menu out of it, including massive research for Dan Dan noodles and its infamous chili oil. Also on the menu was beef and broccoli (I used the same sauce mix in my chicken chow mein recipe) , shu mai (not homemade but if you feel intrigued, here’s a homemade shu mai recipe) , and some “borrowed” fortune cookies from the local Chinese restaurant, which, for fun, Joe made up personalized fortunes for our dinner guests and stuck them in the cookie. Sneaky and fun! Now let’s chat about this dish, shall we? Dan Dan noodles is actually pretty new to me but once I heard about it I was hooked, and let me add, is a quick breeze to make, including the chili oil. You can buy the chili oil at Asian markets or specialty stores. 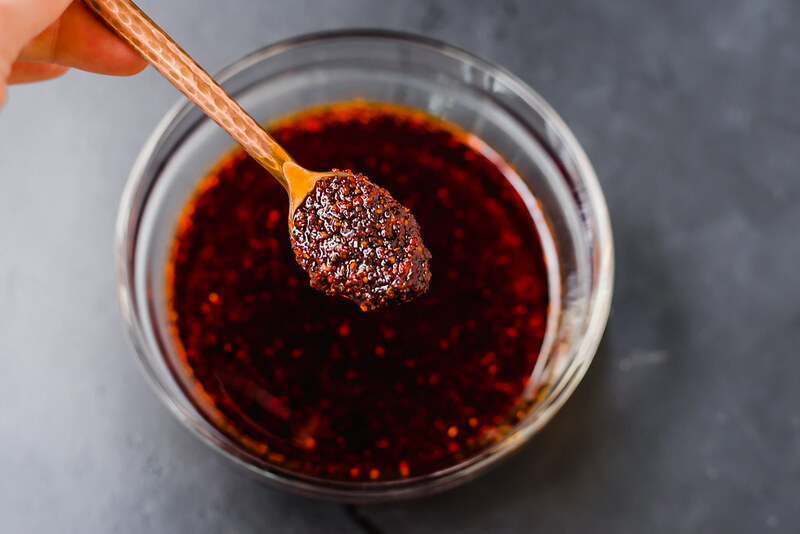 But to make your own, all you need to do is steep aromatics with a high heat cooking oil and once it come to a gentle simmer, carefully pour over your chili flakes. 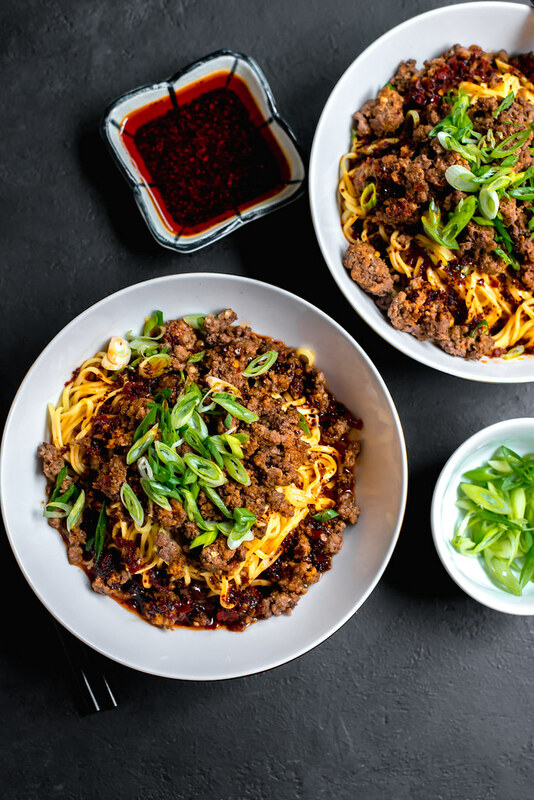 For this recipe, I used Korean chili flakes (same thing you use for kimchi) which is what I had on hand and worked beautifully! Then jar it up and once it cools it’s ready to use. This would make a lovely gift for your spice lover friends as well. And just in case you’re looking to create a Chinese menu of your own, these fried egg rolls are a must make as well as this deliciously savory Mongolian beef saute and one of my favorites, my recipe for shrimp chow mein! To make the chili oil, bring the oil, star anise, garlic, ginger, bay leaves and Szechuan peppercorns to a gentle simmer for about 5 minutes. The garlic and ginger should sizzle but not burn. While the oil is cooking, pour the red pepper flakes in a large heat proof bowl and set aside. Once oil is done, turn off heat and allow to cool for a few minutes. Then strain the hot oil through a sieve over the red pepper flakes. It should immediately sizzle. Allow to cool to room temperature and then pour in sesame oil and stir. At this point you can place it in glass jars and use in recipes. Next, cook the chow mein noodles in a pot of boiling water until just done, about 3-4 minutes. Once done, drain and toss with 1 teaspoon of sesame oil and set aside. In a skillet over medium-high heat, drizzle with 1 tablespoon canola oil and add the ground meat. Use a spatula and break up the meat and cook until mostly cooked through, about 7-8 minutes. Then add in the chopped garlic and soy sauce and cook until garlic is caramelized and meat is cooked through. Once done, turn off heat. To serve, in a large bowl, add about 1/4-1/2 cup of chili oil and black Chinese vinegar and mix. Add the cooked chow mein noodles and top with ground meat mixture. Garnish with more chili oil on top and chopped scallions. Love the idea ! Thank you so much !